Described as a ‘phenomenon’, Tatjana Vassiljeva is known as a musician possessing an irreproachable technique and irresistible range of sonorities, whose superlative virtuosity is of only minor importance beside the strength of musical personality and ideas, and her ability to communicate them. Tatjana’s innate musical curiosity is reflected by her extensive repertoire which ranges from baroque to contemporary music and includes several works of which she has given the world première. Since beginning her performing career at the age of twelve, Tatjana Vassiljeva has performed in Russia and throughout Europe and won prizes at many prestigious international competitions: Tchaikovsky Youth Competition in Moscow (1992), the ARD Munich Competition (1994), International Adam Cello Competition in New Zealand (Grand Prix, 1999), the Pablo Casals Competition in Kronberg, Germany (2000), International Izuminomori Competition in Osaka, Japan (Grand Prix and the Audience Award, 2001). In the same year Tatjana came to prominence as first Russian to be awarded the First Grand Prix de la Ville de Paris at the 7th Concours de Violoncelle Rostropovitch. In 2004 Tatjana was named the ‘Revelation from Abroad’ at the 2005 Victoires de la Musique Classique. Tatjana has built a formidable reputation as one of the leading cellists of today, performing with the most prestigious orchestras including the National Philharmonic Orchestra of Russia, Moscow Soloists, Academic Symphony Orchestra of St. – Petersburg Philharmonic, Mariinsky Theatre Orchestra, London Symphony Orchestra, Orchestre Nationale de France, Orchestre de Paris, Tonhalle Orchestra Zurich, Orchestre de la Suisse Romande, Lucerne Festival Orchestra, Basle Sinfonieorchester, Vienna Radio Symphony Orchestra, DSO Berlin, Lithuanian Philharmonic, Jerusalem Chamber Orchestra, New Japan Philharmonic and the Tokyo Philharmonic Orchestra under such distinguished conductors as Yuri Temirkanov, Mstislav Rostropovitch, Claudio Abbado, Valery Gergiev, David Zinman, Daniele Gatti, Vladimir Spivakov, Yuri Bashmet, Dmitri Kitaenko, Michail Jurowski, Jiri Kout, Sakari Oramo, Christoph Eschenbach, Bertrand de Billy, Vassily Sinaisky, Vladimir Fedoseyev and Krzysztov Penderecki. In 2005 Tatjana Vassiljeva performed the complete collection of works for cello and piano with Paul Badura-Skoda in Paris, and in 2006 performed Beethoven’s Triple Concerto with Claudio Abbado in Venezuela. Other highlights of these seasons were the tour of Spain, concerts in Germany and Holland and a series of concerts devoted to Shostakovich at the Salle Pleyel, Paris and the Philharmonie Luxembourg with Rostropovich and Orchestre de Paris. In May of the following year, she participated in the concert in memory of the great Maestro given by the same orchestra. Krzysztof Penderecki whose Concerto Grosso she has performed many times with various musicians. In 2008 she gave the world premiere of the revised version of the Largo, led by the composer, and recorded his Second Concerto. Her collaboration with the composer continued in 2009 when they gave concerts in Spain together. Important projects in 2008 included concerts with the St. Petersburg Philharmonic Orchestra under Yuri Temirkanov in St. Petersburg and Tokyo and in August of this year, Tatjana made her debut at the Edinburgh Festival performing Prokofiev’s Sinfonia Concertante with the London Symphony Orchestra under Valery Gergiev before playing the same work on the LSO tour in Japan. Following this, she was invited by Maestro Gergiev to perform in a concert dedicated to the memory of Mstislav Rostropovich with the Symphony Orchestra of the Mariinsky Theatre in Russia. She finished 2008 performing Henri Dutilleux’s concerto Tout un monde lointain in Japan with the Osaka Philharmonic Orchestra and Ryusuke Numajiri and in Vienna with the Vienna Radio Symphony Orchestra under the direction of Bertrand de Billy. In 2009 Tatjana performed at the Prague Spring Festival with Jiri Kout, the Folle journées in France and Japan with the famous dancer Saburo Teshigawara, at London’s Cadogan Hall with the Orchestre National d’Île de France under Yoel Levi, and in La Grange de Meslay festival. Highlights of the 2010-2011 season included performances at the Théâtre des Champs-Elysées with Orchestre Nationale de France/Daniele Gatti, with the New Japan Philharmonic Orchestra and Hugh Wolf in Tokyo, several concerts with the Munich Philharmonic / Dmitri Kitajenko at the Philharmonic Gasteig in Munich, with l’Orchestre de la Suisse Romande / Miguel Hart Bedoya in the Victoria Hall, Geneva, with the Orchestre National du Capitole / Tugan Sokhiev in Toulouse and a tour with Vladimir Fedoseev and the Tchaikovsky Symphony Orchestra performing at the Tonhalle Zurich, Grand Hall of the Moscow Conservatory and the Grand Hall of the Musikverein in Vienna. As a chamber musician, Tatjana Vassiljeva performs at international festivals such as Lockenhaus, Verbier, Kronberg, Colmar, Elba, the Rencontres de musique de chambre at Chambery and La Grange de Meslay and the Folle journées in Nantes and Tokyo in collaboration with Viktor Tretiakov, Vladimir Spivakov, Yuri Bashmet, Denis Matsuev, Gidon Kremer, Maxim Vengerov, Baiba Skride, Sayaka Shoji, Jean-Frédéric Neuburger, Plamena Mangova, Antoine Tamestit and Renaud and Gautier Capuçon and Paul Badura-Skoda. As a frequently invited soloist with the of Philharmonic Camerata,Tatjana has a strong artistic relationship with the musicians of the Berlin Philharmonic and in 2007, along with several oft the string soloists, created the Berlin Philharmonic Quintet with which she has toured extensively throughout Europe and Asia. In 2009 and 2010 respectively Tatjana recorded Bach’s Six Suites for Unaccompanied Cello for which she received the ‘CHOC’ (the highest recommendation) from Classica Magazine and the the Alkan and Chopin cello sonatas with Jean-Frédéric Neuburger for MIRARE. Her most recent releases are the the Penderecki Concerto No. 2 with Antoni Wit and the Warsaw National Philharmonic Orchestra on the NAXOS label, which received the Contemporary Award at the 2012 International Classical Music Awards, and a CD of works by Dvorak with the Berlin Philharmonic Quintet on PENTATONE. 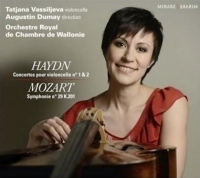 Tatjana Vassiljeva was born into a musical family in Novosibirsk, Russia and began studying the cello at the age of six with Eugenij Nilov at the Special Music School. From 1989 to 1995 she was in the class of Maria Zhuravleva at the Central Music School in Moscow and, having won second prize at the Munich Competition in 1994, she moved there to study with Walter Northas at the Music High School. After graduating with distinction, completed her postgraduate degree with David Geringas at the Hanns Eisler Music College in Berlin.